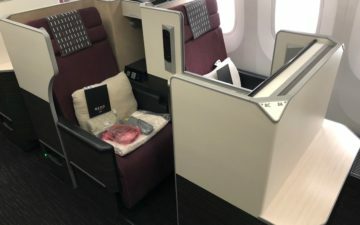 While the Delta offer isn’t new, American matching it is. American’s offer is much simpler. They’re offering double EQMs and triple RDMs for all travel originating and terminating in RDU, STL, PIT, and BNA. Registration is required for both offers. As long as US Airways doesn’t get into it in Pittsburgh as well, I’ll be happy. The more business travelers that can be lured to other airlines in PIT, the better. In checking a variety of routes on DL, RDU-ATL (5K+704) at $119 R/T comes out the same as RDU-LAX (10K+4604) at $310, with each being 2.1 cents per mile. STL-FCO on DL yielded 35,340 for $845 for 2.4 cents per mile. AA on RDU LAX came out at $320 for 13,812 RDM and 9,208 EQM for 2.3 cents per RDM mile. STL to FCO for 31,020 at $843 was 2.7 cents per mile. Looking at Asia, RDU-Shanghai (PVG) on AA would yield 43,350 miles but at $1,110 for 2.4 cents/mile. If one is just out for miles, it does just compare to buying 100,000 on US for $1,375 through 7/31 which is 1.375 cents per mile, but no status. I checked mid-September with a Saturday night stay, but could be interesting if a sale pops up or better yet, a fare mistake. Triple EQM and RDM on LGA-ORD doesn’t even come close to these offers at $202 R/T, which yields 4.6 cents per mile. There are some HKG fares out of BNA that are pretty low. With elite and the 3x it is around 1.7 cents per mile RDM. With the Cathay segments NRT-HKG that don’t count, the EQM is 3 cents or so. Digging a little more, RDU-DFW-SEA on AA was the best bet in the middle of September (random time I looked) with no Saturday night stay required. Yielded 16,326 miles for $279 all in, 1.7 cents per mile. Not familiar with AA’s routing rules and whether one could double connect in DFW and ORD for the $119 each way fare. A double connect would yield 21,504. Looking at the EQM for the RDU-DFW-SEA, assuming the 25% and 100% bonus that kick in at 25K and 50K status levels only apply to the base mileage and not the inflated double amount (is this the case Lucky?,) it would take $1,946 and 7 roundtrips to qualify for Executive Platinum on AA, along with almost 170K of RDM. Very tempting indeed. Never had status as I always had tons of miles from credit cards to throw at the problem, but now I am getting more interested in how this all works as those finally dwindle. I am a mileage runner as I believe the best routes via RDU on AA is via Toyka’s NRT. Pricing for 3 nights while you fly for a day comes up with $1043.00. That’s 15,152 base mileage (via RDU-LGA-ORD-NRT and NRT-LAX-DFW-NRT) so that’s 45,456 on your account and a bit over 30,000 on regaining your status. As a 100,000 mile runner with AA, you can check out the First class lounge in NRT and in LAX too.